This fully updated resource provides clear step-by-step guidance to help victims of crime and witnesses to crime navigate the process and access all available services. This publication, which updates the 2005 Guide, is in two parts. 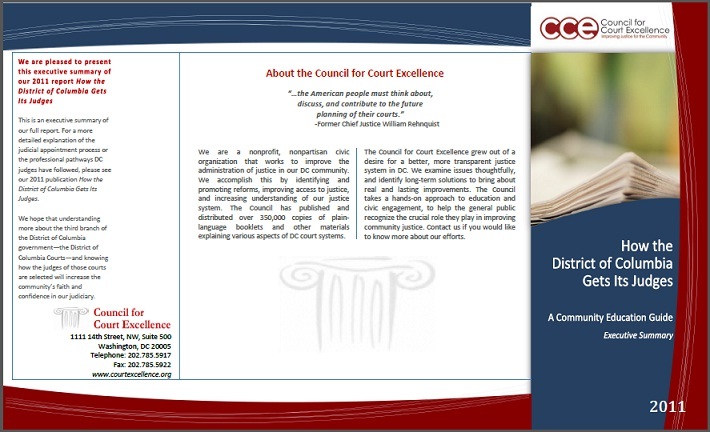 Part One describes the District of Columbia’s judicial appointment and reappointment process for both trial judges on the Superior Court of the District of Columbia (Superior Court) and appellate judges on the District of Columbia Court of Appeals (Court of Appeals). Part Two narrows that focus to cover only the Superior Court. 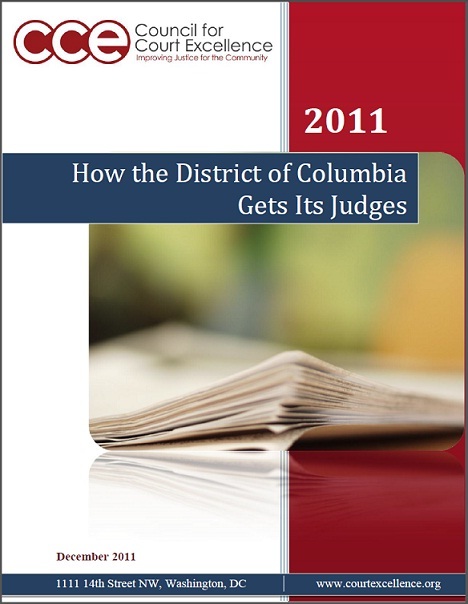 In order to illuminate the various pathways to becoming a trial judge in the District of Columbia, Part Two provides detail, based on Council for Court Excellence research, about the professional backgrounds of the 150 persons who have been recommended by the District of Columbia Judicial Nomination Commission for nomination to the Superior Court between 1994 and August 2011. This brochure acts as an Executive Summary of the full report, also available on this site. The Handbook is accurate as of September 2009. Keep in mind that court rules and procedures are subject to change. Points of view expressed in the Handbook are those of the authors and do not necessarily represent the official position or policies of the State Justice Institute or the other supporters of the Handbook. 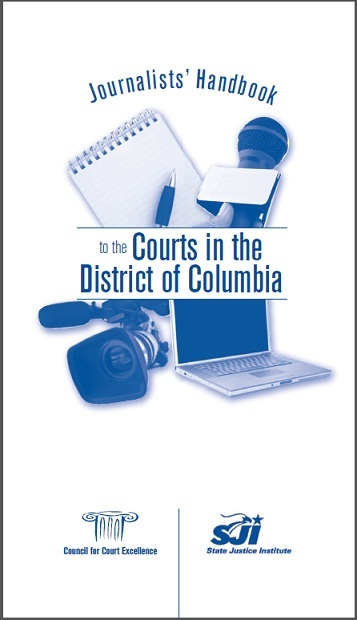 This guide has a single important purpose: to increase community understanding of the District of Columbia's juvenile justice system. It's not an easy system to understand. The DC juvenile justice system is complex; it involves several different agencies of government. 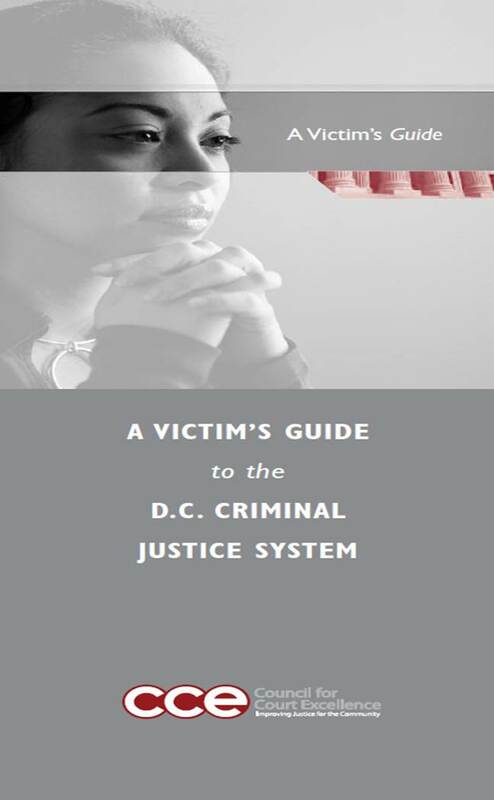 We hope this general guide provides members of the community with the information they need in order to understand how juvenile justice is supposed to work and then to hold the DC juvenile justice system accountable. (Spanish Version of Guide to the DC Juvenile Justice System.) Esta guía tiene un solo objetivo importante: aumentar la comprensión de la comunidad del Distrito de Columbia al sistema de justicia de menores. No es un sistema fácil de entender. El sistema de justicia de menores de DC es complejo, e involucra varios organismos del gobierno. Esperamos que esta guía general proporcione a los miembros de la comunidad la información que necesitan para comprender cómo la justicia de menores esta supuesta a trabajar y, para poder mantener responsable al sistema de justicia de menores de DC. When Someone Dies: A Non-Lawyer's Guide to Probate in Washington, DC. This new edition is written to explain simply the District of Columbia probate process, the Non-Lawyer's Guide provides useful step-by-step information, a glossary of terms and helpful contacts, on how to settle the financial affairs and distribute the property of a deceased Washington, DC residents. Please call 202.785.5917 to order over the phone. (Spanish Version of When Someone Dies.) Los conceptos y el lenguaje jurídico asociados con el proceso de convalidación testamentaria pueden resultar confusos. Esta guía ha sido diseñada para ayudar a habitantes de la ciudad de Washington a navegar el sistema para que no haya problema alguno cuando usted ó alguien de su familia fallezca. Recuerde que la convalidación testamentaria generalmente se realiza en la ciudad o condado en el que la persona fallecida era residente. This "fill-in-the-blanks" estate planning Record Book is organized to help you list and record the location of your important personal and financial papers. It is a handy reference which has been distributed widely throughout the nation. (Spanish Version of the Personal Affairs Record Book.) Esto es un libreto acompañante a Cuando Alguien Fallece: Una Guía sobre el Proceso Testamentario y de Sucesiones en Washington, DC para Personas que no son Abogados.